Sox at the Sumida River. At the very end of 2010, I got my first dog in Japan. In Canada, I have had a Chihuahua, a German Shepard-Labrador mix, and a Pomeranian-Chihuahua mix. This time, I adopted a small energetic dog named Ponta from a volunteer that found him in a shelter. He was quickly renamed Sox, which he enjoyed a lot more than Ponta. It took about a year for him to relax in my apartment and now he is completely my dog. He is too smart for everyone and knows how to get attention when he wants it. He is the alpha dog in my apartment at times, but at other times, he is very soft and caring. Shibas are an interesting breed of dog that is completely different from any dog that I have ever known. They are handsome, independent, and loving. Recently, I took a bit of time to learn a bit more about Sox and his ancestors and a lot of the information I got is starting to open my eyes into his personality. The history of the Shiba Inu is a little complex, yet intrinsically simple. Japanese dogs, on the whole, were brought to Japan during the Jomon Period, roughly 14,000-300BC. Most articles I have read placed Japanese dogs in Japan around 7000BC which coincides with the first group of permanent residents in Japan. In fact, Jomon is the very first period known in Japan. Today, there are 6 breeds of Japanese dogs, the Akita, Kishu, Hokkaido, Shikoku, Kai, and the Shiba. The Akita is the largest, and the Shiba is the smallest. When looking into each of these dogs, it is really easy to be confused as to which breed is which as they are all similar and I wouldn’t be surprised if they did come from the same ancient group of dogs. Shibas themselves were bred to be hunters. They are spry little dogs that were used for hunting birds and other small game. They had been bred to be independent hunters that will go out, catch their prey, and then wait for their owners to pick it up. The owner didn’t have to do anything as the Shiba would do everything themselves. The origins of the name Shiba is not very well known, but many people have guessed at its meaning. The most popular explanation is “brushwood”. Shibas would hunt from small brushwood bushes to catch their prey. The second explanation is also regarding the brushwood and the colour of the leaves of the brushwood during the autumn season. In autumn, the brushwood would turn red which was the same colour as most Shibas today. 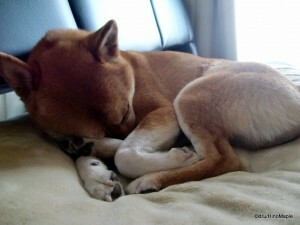 The final explanation is that Shiba is an old archaic term that means small or little. Many people combine all of these to explain the meaning of a Shiba Inu. The Shiba Inu had done well in the past, but in modern times, the Shiba Inu was nearly wiped out. During WWII, many people were killed during the fire bombings and many Japanese dogs were also killed as collateral damage. Most Japanese breeds were nearly extinct and they survived only in the countryside. There used to be 3 distinct types of Shibas, but after the war, the 3 groups were combined in a breeding program and the result is the modern Shiba that is now healthy in numbers. The owner under this blanket is “MINE”! I was asked by Rurousha about the difference between an Akita and a Shiba. This was actually the inspiration for me to write about Shibas as I honestly didn’t know the difference between the two aside from the size differences. In reality, a lot of the Japanese dogs are very similar in their traits, but the main differences are the sizes. Shiba, as mentioned, is the smallest breed of dog from the Japanese dogs, and Akita is the largest. They both have very similar physical appearances and similar personalities as a whole. Some people have said their personalities are the same, and some say they are different. It is hard to get a good answer from English based websites and unfortunately I can’t read enough Japanese to understand them at the moment. In terms of a Shiba’s personality, it can be summed up into one word, “independence”. Shibas are a very independent dog. They don’t always need a lot of interaction as they can do a lot on their own. They are notoriously hard to train unless you have a reward for them. Sox will never come to me unless I have a treat waiting for him. Shibas are also very smart, in fact, they are too smart. There is a reason why Sox won’t come to me when I call him, it’s because he doesn’t want to. When I have a treat, I can teach him many tricks, and he has done a lot now. I would say he knows more tricks than all of my past dogs combined. The only problem is that he refuses to do tricks unless there is a benefit for him. This leads to the next trait, selfishness. Shibas tend to be very selfish. Whatever is yours is not yours, it’s theirs. The perfect example I saw was that if a Shiba could say one word and only one word, it would say “mine”, “It’s ‘mine’ food, ‘mine’ water, ‘mine’ toys, ‘mine’ sofa, ‘mine’ crate, ‘mine’ car, ‘mine’ owner, and ‘mine’ world”. In a nutshell, that’s what a Shiba is like, and Sox is very much like that too. He goes wherever he wants, forces his way onto your lap, and proclaims anything that enters my apartment as his own. In fact, all of my friends end up being his friends, not mine! While it is easy to generalize a breed and say they have this personality or that, it is actually much more difficult than that. I read that trying to force a dog into a specific personality is like saying a Japanese person is always “this”. Like people, dogs have their own unique personalities and like people, the way they were raised affects their personality a lot. Sox fits the profile of many Shibas but he also doesn’t. He is very smart and independent and he also loves to keep everything for himself. 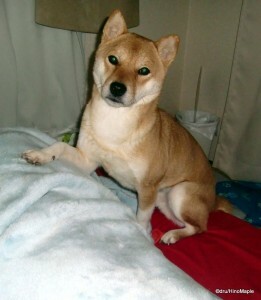 He is fastidious like most other Shibas but he is very friendly with people whereas most Shiabas aren’t. Sox is one who loves to jump onto people when they first arrive and his tail is always wagging when they come. It is very rare to see a Shiba wag their tail, but Sox is one dog who does. He doesn’t always get along with other dogs, just like other Shibas, but it really depends on the breed. He doesn’t enjoy meeting bulldogs or pugs, and he really hates puppies. He seems to be okay with other Shibas but it is on a case by case basis. Sometimes he is good, and other times he is bad. Sox loves to be pet and he is one of the most opportunistic dogs I have had. 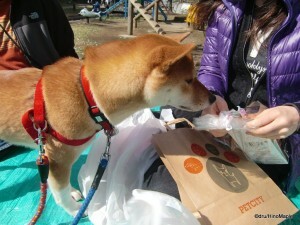 If you turn your eyes away on food, especially during a picnic, he will eat it in a second. He won’t even chew it; he will just gobble it down in one bite. He is very energetic when we go for walks, but hates to get a collar and harness put on. Many Shibas are very catlike in how they feel they are the king and hate to be restrained. Sox is very much like that and shudders when he gets his collar put on. I read something about a Shiba shake that said many Shibas, when nervous or when something they don’t like is on them, they have a specific shake. Sox does this. Basically, he turns his head a little to the side then does a violent shake from head to tail. It is a very cute thing but I feel sorry for him when he does this. He also hates to wear anything from a rain coat to hats. He is almost never wearing clothes, but I also disagree with having pets wear anything. One of the more annoying parts of having a Shiba is to know what to call the breed itself. Of course my dog is Sox and he is a Shiba, but is it a Shiba, Shiba-inu, or a Shiba-ken. The words Shiba-inu is translated into Shiba Dog. While this is the most common form of referring to the breed in English, it is very strange here in Japan. Most Japanese breeds use the suffix “ken” to refer to the type. 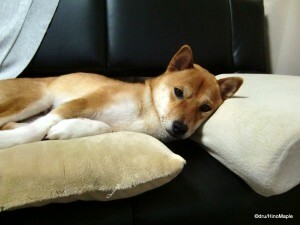 Shiba-ken is the most often used form in Japan, at least from what my own students say when I tell them I have a Shiba. Personally, I prefer to use the word Shiba when speaking in English. I sometimes use Shiba-ken but usually when talking to a Japanese person or when speaking in Japanese. It is just a personal preference of mine. Shibas are probably one of the best dogs you can ever get. They aren’t too big and they aren’t too small. You can pick them up without any problems and they are easy to train if you have food in your hand. They show a lot of love and affection for their owners and they are generally friendly, or just distant from any house visitors. This is great as my past dogs wouldn’t allow me to have visitors because I couldn’t they would attack the visitor or look too intimidating. Sox is perfect, but I’m sure I am completely biased. Shiba Inu is part of a pet series here on Dru’s Misadventures. To read more, please continue with “Pets (Dogs) in Japan”. This entry was posted in Culture and tagged Akita, brushwood, Chihuahua, Dog, dog breed, dog personality, German Shepard, japan, Japan Dog, Japanese Dog, Jomon Period, Labrador, mine, Pomeranian, Ponta, Shiba, Shiba Dog, Shiba-inu, Shiba-ken, Sox by Dru. Bookmark the permalink. Awww! That last photo! Awww! Random thoughts in no particular order. 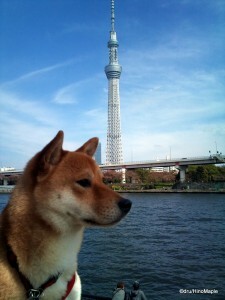 1) Sky Tree and Sox! Wheee! You’ve made my day. 3) You had a chichuahua? I had lapdogs as a child, but the older I get, the more I prefer big dogs. Or rather, small/medium dogs with big personalities, like a Shiba. Yup. You inspired this post, but it was written about half a year ago! Talk about postponing. Yup yup and yup. Chihuahuas are nice. Mine was cool but I don’t like them in general. Sox is great but I still miss my old German Shepard Lab cross. 4. Tell me about it. It is hard to get a video of his shake, but if I ever get one, you know it will be coming here sooner or later. It is hard to get mad at him but it is possible. I just can’t stay mad for long. A very eye-opening post for me as I know next to nothing about most dogs anyway. There’s a great show on National Geographic called the “Dog Whisperer with Cesar Millan”. It’s a good show to learn about dogs, and even for dog owners hoping to train their bets better.